* new simple examples: idm, pat effect 29 random note from trk0. 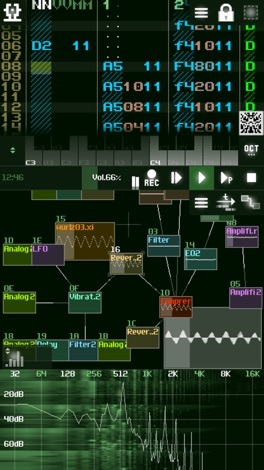 SunVox is the most powerful music creation tool for iOS. It is a small and fast cross-platform modular synthesizer with pattern based sequencer (tracker). 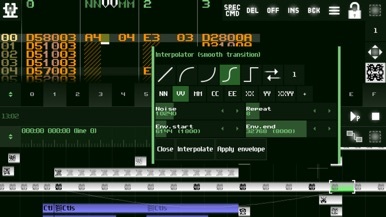 Sunvox is a serious music application. I am personally running it on my iphone. In the overcrowded world of music apps, Sunvox stands out as both unique and powerful. If you are a musician and own an iphone, you owe it to yourself to try this amazing application! 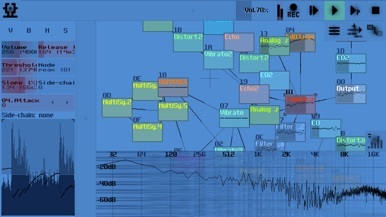 • Powerful microtonal (ultra-chromatic) sequencer. • Highly optimized synth algorithms. • Support of 16/24/32bit WAV, AIFF and XI samples. • XM (FastTracker) and MOD (ProTracker, OctaMED) import. • Mic/Line-in recording (using the Sampler). • Audiobus 3 (with MIDI) and IAA support. • It is also available for other systems (see the site). 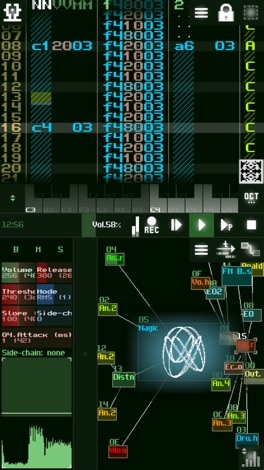 The main menu - button with the SunVox icon in the upper left corner of the screen. Use multitouch to scale/move content of timeline and pattern editor. To connect one module (source) to another (destination): first touch on the source, second touch on the destination.